Not all cannabis products are created equal. Some have higher potency and purity than others; hence the importance of testing with a Florida cannabis lab like Modern Canna Science. Marijuana’s overall effectiveness and bioavailability may also be due to what is known as an entourage effect. Understanding how the entourage effect works may help users determine product selection when navigating the huge swath of cannabis products in the market. For distributors, this helps them come up with higher-quality products for both medicinal and recreational use. What Is a Cannabis Entourage Effect? It’s a well-known fact in the supplement and alternative medicine industry that foods contain multiple vitamins, minerals, and antioxidants. Rather than working separately, these have a synergic effect where each complements the effects of the other. Cannabis is very similar. While cannabidiol (CBD) and THC are the two most common cannabinoids, some cannabis species have as much as an estimated 400 cannabinoids. Beyond cannabinoids, cannabis also has just as many if not more terpenes. These dozens upon dozens of cannabinoids and terpenes work in unison to produce its effects on the human body. Of course, studies have shown that many of these compounds have their respective benefits, but other reports suggest that the benefits are amplified when in the presence of other compounds. That is basically the entourage effect, where cannabis benefits (and sometimes side effects) are enhanced when taken with other compounds found naturally in the marijuana plant. The marijuana community has mix feelings regarding the entourage effect. Some swear by it, while others believe it has a placebo effect at best. What does the science say regarding the entourage effect? Studies at this time are limited, though a few do exist that support the entourage effect. One study supports the theory that THC may have a heightened effect when consuming a strain with a rich cannabinoid and terpene profile. Researchers, though, acknowledged that further studies are needed before a more definitive conclusion is reached. Cannabis is also sought after for its anti-cancer properties. In a more recent 2018 study, researchers concluded that terpene-infused THC may have higher anti-tumor properties compared to isolated THC. More studies are in order, though early research is promising. Even so, some users and distributors are still skeptical. More growers, however, fervently believe in cannabis synergy and have experimented with various cross-breeding practices in order to produce an ideal yield with maximum bioavailability. Marijuana bioavailability is in large part due to the terpenes. In the past, researchers believed terpenes attributed mostly to the cannabis’ flavor but little else. That is no longer believed to be the case and many suspect terpenes hold just as many beneficial properties as the cannabinoids themselves. 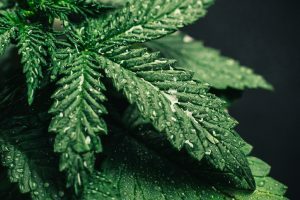 Researchers began suspecting a synergic effect after they noticed cannabis plants of the same strain and chemotype would have different degrees of effect. How exactly do the terpenes alter cannabinoid function? Researchers are still trying to figure this out, but evidence suggests terpenes directly influence brain neurotransmitters, which in turn affects the way cannabinoids bind with neurotransmitters and CB receptors. The terpene myrcene, for example, is said to greatly enhance THC’s effect as a relaxant. The same is said of the terpene linalool. By contrast, the terpene limonene is believed to do the opposite and act as a stimulant. With better understanding of the entourage effect, more product makers are releasing full spectrum oils and tinctures. Unlike isolated CBD and THC, full-spectrum contains multiple cannabinoids and terpenes. For cannabis suppliers, it’s more important than ever that they adequately label their products. This includes disclosing every cannabinoid and terpene regardless of whether the product is intended for medical or recreational use. To ensure product integrity, suppliers need to be able to verify every compound listed is actually in the product and in the specified concentrations. Modern Canna tests for terpenes, including the most common terpenoids, such as limonene, borneol, and alpha and beta pinene. We also test for specific cannabinoids. This is especially important since some cannabis products cannot exceed 0.3% THC levels. Knowing THC concentrations isn’t just vital for legal reasons but also for ensuring users specifically get their required medical dosages. Anything more or less may result in side effects or diminished results. Even if manufacturing CBD or THC isolates, you still need to submit samples for testing to ensure purity. As more people educate themselves about marijuana, they learn more about its properties, including the entourage effect. As such, they want to be sure dispensaries supply what they advertise. To boost consumer trust, send a sample to Modern Canna for testing. This guarantees that the marijuana you supply contains a diverse range of cannabinoids and terpenes for a highly bioavailable synergic effect.